Are you the type of person that likes to jam out!? Then this is the right 2D Bag for you. Featuring retro like characteristics perfect for the music fanatic that you are. This very bright and bold 2D Bag stands out from the crowd… literally! Are you the type of person that likes to jam out!? Then this is the right 2D Bag for you. Featuring retro like characteristics perfect for the music fanatic that you are. 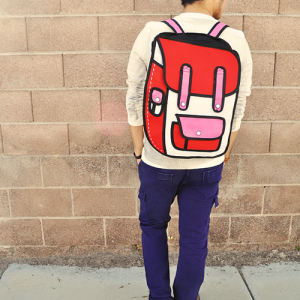 This very bright and bold 2D Bag stands out from the crowd… literally! Now all you need is some cardboard and some break dancing. With two choices to pick from, retro will always be in style. 1. Main component for items such as a tablet, magazine, clothes, makeup, etc. 2. Secondary compartment for glove fit for phone, chargers, pens, and smaller items. 4. Impress friends with a extremely high contrasting bag. Crank up the volume in your life!